Carnivores: Dinosaur Hunter is a console-quality hunting game which lets players explore huge non-linear locations as they attempt to track down a variety of dinosaurs and not become a prey. The dinos boast with some of the most advanced AI on the platform, evolving from “pea-brained” dummies to dangerous creatures that are able to see, hear and sense the adrenaline in hunter’s blood. 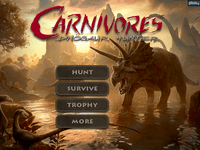 Carnivores: Dinosaur Hunter is your ultimate choice if you’re interested in real life hunting experience rather than visiting a shooting range. With 16 different dinosaurs across 6 distinct environments including pine forests, muddy marshes and rolling hills, how you approach your target is important. Wind direction, scent and the use of a special dinosaur call are all key elements in tracking your prey. • Huge 3D world, open to explore! • Console-quality HD graphics with Retina support. • 3D dinosaurs, from the Herbivorous (plant eating) for novice hunters to the Carnivorous (meat-eating) for experts. • Choose from among six different weapon types – from a sniper rifle to an X-bow. • Hunting accessories for smart hunting. • Survival game mode: a timed, frenzied affair where dinosaurs run onto the player in waves witha clear intention to fress him. Plus+ integration lets compete for the longest survival. • Interactive Dino Trophy Room. • Online leader boards and social networking integration. • Use your single Plus+ account to play on multiple iDevices.